Jamestown, NY – Artists from Chautauqua and Cattaraugus Counties will be featured during the final Salon in conjunction with the Women Create art exhibit on Wednesday, March 21, 7-9 pm. Artists from Chautauqua and Cattaraugus Counties will be featured during the final Salon in conjunction with the Women Create art exhibit on Wednesday, March 21. 7-9 pm. The Salon will be held in the 3rd on 3rd Gallery, 116 East Third Street, next to the Reg Lenna Civic Center in downtown Jamestown, where the exhibit runs through March 31. 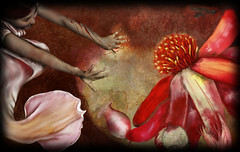 Shown here is the mixed media print “Red Garden 5” by Fredonia artist Jill Johnston, one of the presenters. The Salon will be held in the 3rd on 3rd Gallery, 116 East Third Street, next to the Reg Lenna Civic Center in downtown Jamestown, where the exhibit runs through March 31. At the informal gathering, Anne Conroy-Baiter of Allegany, Barbara Fox of Little Valley, Jill Johnston of Fredonia, and Kathleen Tenpas of Panama will give brief talks about their work, interspersed with questions, answers, and conversation. The women’s presentations will focus on their works on display and their personal philosophies and perspectives on art. Anne Conroy-Baiter is exhibiting “On the Fly,” a watercolor on stretched paper. She plans to start a discussion by sharing how her roles as mother, professional, freelancer, and artist directly affect both the subjects and techniques of her artwork. Barbara Fox’s watercolor “Sweetness and Light” is an example of her belief that no matter what the subject, a painting should incorporate beauty and technical fluency, be compelling and foster further investigation. A prolific painter, workshop leader, and designer for the U.S. Mint, she looks forward to this informal talk about what motivates and inspires her. There is no charge for this Salon sponsored by Creative Arts of Women, WNY Chapter, but donations are gratefully accepted. The Women Create exhibit is presented in cooperation with the Arts Council for Chautauqua County. Regular hours are 10 am-4 pm, Monday-Friday until the closing reception on Saturday, March 31. For viewing by appointment, contact Len Barry at (716) 664-2465, ext. 227.